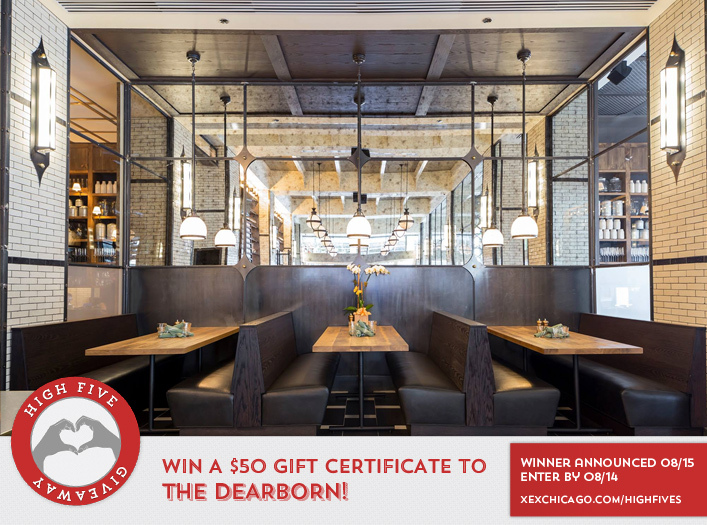 Win a $50 Gift Certificate to The Dearborn Tavern! Congratulations to Sue Herrmann on winning our 179th High Five Giveaway! Thanks to all who entered. Anchoring the southeast corner of Dearborn St and Randolph St, The Dearborn is an 8,000-square-foot, 225-seat, urban American tavern by sisters & proprietors Amy Lawless and Clodagh Lawless. Let Executive Chef Aaron Cuschieri inspire your palate, adding his eclectic twist on sophisticated classics, laid back ‘lick your plate’ dishes & essential Chicago favorites. Meet at the bar, dine in the restaurant, grab a post-theater night cap at The Dearborn. The Dearborn is located at 145 North Dearborn Street, Chicago. Learn more about The Dearborn at TheDearbornTavern.com or call them at 312-384-1242. We posted a quote from a celebrity on Sunday, July 16. Who was the celebrity? Now, just add a comment to this post with the right answer to be eligible to win! The winner will be announced on Tuesday, August 15. Enter by midnight on Monday, August 14! Lucille Ball! one of my favorites! Lucille Ball of course! I have adored her all of my life! Answer is Lucille Ball. Chris has done an excellent job with my color upon visiting Chicago. Wondering how hair painting would differ from biolage? Lucille Ball! I Love Lucy! Doesn’t look like “Here’s Lucy”, but it was Lucille Ball.